Dorothy L. Sayers, 1929, 567p. Strong Poison opens during the closing moments of the murder trial of Harriet Vane, who stands accused of poisoning her former lover with arsenic. The judge is summing up, and we witness his summations from the gallery, with the commentary of various spectators. The victim, Philip Boyes, ate a meal with his cousin, then went for coffee with Vane, then fell ill before returning to his cousin's house, where he died three rather vividly described days later. Despite appearing to be an open-and-shut case, the jury is hung, and a retrial is ordered. Lord Peter Wimsey, who is among those in the gallery, has come to two conclusions over the course of the trial: Vane is innocent of the crime, and that he must marry her. Lord Peter by this time (his fifth novel) is a somewhat famous amateur sleuth, and with Vane spared for the moment from the gallows, he attaches himself as an agent for the defence. The re-trial will likely begin in about a month, which Lord Peter hopes will be enough time to both save her life, and successfully court Vane. My wife and I have been conducting a lazy survey of the history of detective fiction, and P.D. James' Talking About Detective Fiction1 has been something of a roadmap. She identifies Wilkie Collins excellent Victorian The Moonstone as the first true contemporary detective novel, and we started there2. Between the wars in England was considered "the golden age" of detective fiction, made most famous by Agatha Christie. James encourages the serious reader to skip over Christie and look at some of the other excellent female writers of the time, including Sayers, Margery Allingham and Ngaio Marsh3. Sayers was first up in our survey, and this was our initial selection4. We picked an entrance work that is well in to the series, which always has challenges. 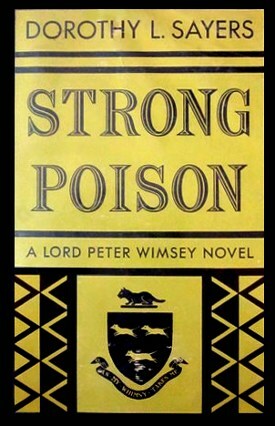 Strong Poison was reportedly one of the highlights of the series — she had her primary characters down, and was skilled in what she was doing. Authors have to strike a balance between repeating descriptions (and potentially boring faithful readers), or leaving new readers behind. Sayers errs a bit on the side of leaving new readers behind. I was 60% of the way through this story before I had any sort of a mental picture of Wimsey (apparently he wears a monocle!) and the partnership between Wimsey and Miss Climpson was hazy for me at best5. Wimsey himself was a much less serious character than I had been expecting. He spends the bulk of the novel cooing piffle and massaging his temples. The heavy-lifting is left to an army of cast-off women in his employ ("the cattery"), apparently a standing army for such purposes. While I think Sayers certainly has the early century English aristocrat painted, (at least in compelling caricature: a stroll in the garden with a constant burble of jovial twaddle,) it starts to wear on me after a bit. And apparently it wore on Sayers too. A lesson to those starting a detective series, I suppose: If you couldn't stand to spend an afternoon with your character, you will surely be sick of him after a dozen novels. Given that Sayers appears to be P.D. James' favourite writer from this era, I shouldn't have been surprised by the attempts at social realism here. It feels confined by the genre, something that chafed at Sayers but which she felt was impossible to penetrate. Raymond Chandler famously dismissed the British Golden Age Detective novel (and much of the English detective genre to that point) in his 1950 essay "The Simple Art of Murder"6, and while I don't cast it all away as vigorously as he does, he has his finger on the bulk of the problem here. There is a crime, but everything is penetrated by a surreal British sense of order and gentility. The crime isn't brutish, it is sophisticated. In this type of novel, order is momentarily interrupted but restored in an unreal dashing way. Chandler would seem to wave this all away as profoundly unreal, but there is a reality working away within the unreal form. Harriet Vane's social situation is an easy example: her concession to reside with her lover outside of marriage taints her in her trial and alters her social standing. When her lover has a change of mind, and decides to marry her after all, Harriet is enraged and refuses. It seems easy to understand from her perspective: she incurred great social cost for something that was obviously a whim of little consequence to him. But many of those surrounding cannot understand her refusal to "patch her honour". The breadth of her agency clearly unsettles many. The fascinating example to me is Miss Climpson and her "ladies". These are all single women with tremendously precarious standing, common in England after the First World War. With astounding numbers of young men killed in action, a sea of women existed who were unable to marry and restricted in their employment. Lord Peter harnesses this power, depending on their invisibility and deep desire to be useful. Or does he take advantage of their situation? Reading it from this remove, I found aspects of it a little dark. Lord Peter charms and validates these desperate women, who then take great chances and even break laws to further Lord Peter's cause. For me, this dynamic was the most interesting aspect of the book. I couldn't resolve whether Sayers had a stance here at all, which I suppose is what cleaves social realism from political writing. Lord Peter did what he could do, and that he could do it at all is perhaps the point. And for me, this is where I reject Chandler's thesis that reality must pervade a fictional work to exist at all. It feels like rejecting painting because it isn't three dimensional, or sculpture because the horseman doesn't smell of leather. It was those moments of reality that made this book so readable. The mystery itself was interesting enough, and familiar and comfortable and suitably tense in places. But those great gold moments where reality pokes through the folds kept me engaged. Talking about Detective Fiction is an excellent shorter read - far from an exhaustive history of the genre, it is a survey peppered with James' bold and engaging opinions combined with significant thought on the evolution and contexts of the genre. Kiirstin reviewed Wilkie Collins' The Moonstone. I think that Kiirstin and I might attempt Allingham next in our survey of golden age works, though I have come to the conclusion that I can only avoid Christie for so long. Kiirstin also reviewed Strong Poison. If you are wondering, she was the one that cheated on the cover; the library edition we read had the striking black and chartreuse cover shown above. Some research suggests the Climpson and her Cattery enter the series fully established, with little background. Re: the Cattery, I don't think you're giving the women quite enough credit. I don't see Lord Peter as taking advantage of them exactly so much as giving them an opportunity they would otherwise have been denied. They are well aware of the risks, and I'm not sure they do what they do for Lord Peter so much as for fun and interest. Re. James and Christie: I overstate her dismissal somewhat, I will admit. The use of the word "skip" is probably misleading. I might say she said something more like "The Golden Age doesn't and shouldn't stop at Christie." James highlights Christie's successes as well as her problems. Re. the cattery: I say "Lord Peter harnesses this power, depending on their invisibility and deep desire to be useful." I don't state that he takes advantage of them, I think that there is ambiguity here. Murchison in particular is clearly charmed and flattered by his attentions (though she is also somewhat impatient with them), though I don't mean to suggest that is the extent of their motives. My point was that Sayers presents this scenario, but doesn't appear to judge it. I didn't think I was judging it either.